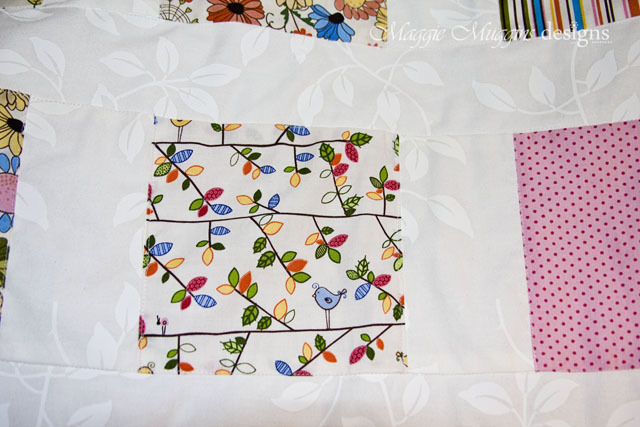 Remember the giveaway I had recently for a baby quilt? I have neglected to show you the finished quilt. 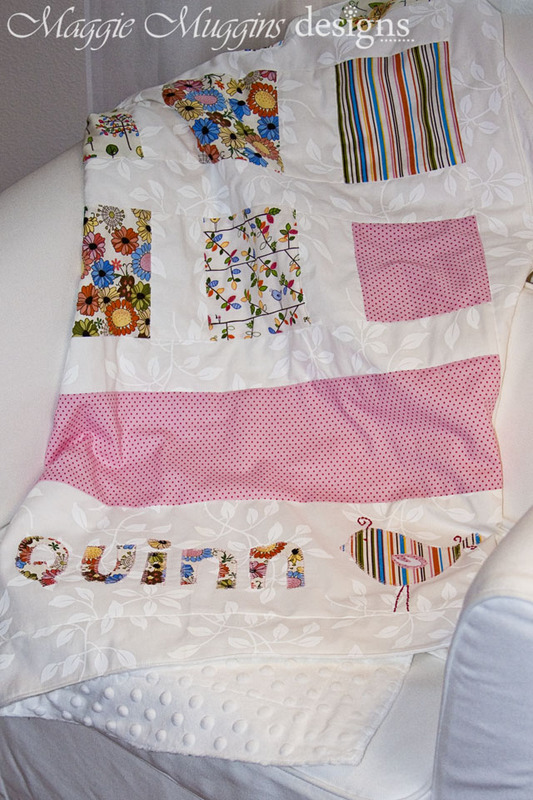 The name the winner wanted changed, but this little quilt is hopefully now being enjoyed by Quinn! She is a triplet! Her two brothers won't be too jealous of the quilt though, it's very girly! I used fabric from Joanns and had so much fun designing this! 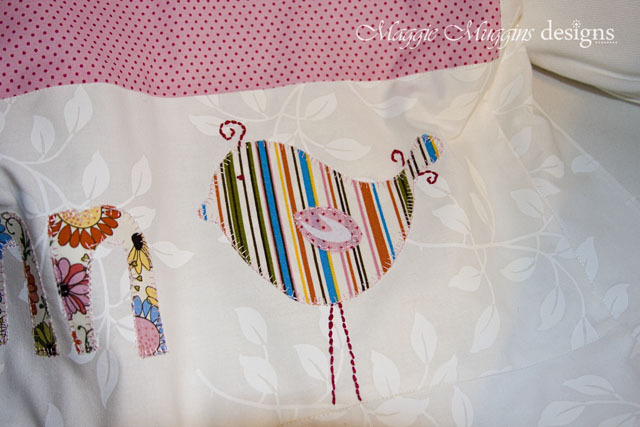 I used the little bird in the fabric as a pattern for the appliqué. I cut the letters and bird on the Silhouette using the Sewable Fabric Interfacing! It was much easier to use this time, but PLEASE ALL - use the thin media cutting mat. I tried the thick and the interfacing is still stuck to it, it was a mess! I tried to peel it off, but it didn't work, washing it off didn't help either. Luckily I have another mat. To make your own appliqué using shapes in your fabric you can either scan or take a picture of the fabric and open the image in Silhouette Studio. Then either trace or draw around the parts of the image you want to make. *Some drawing may be required. I love how the bird is a combination of things: Fabric, Fuzzy Heat Transfer Vinyl and Embroidery! I even chose the appliqué stitch that I did because I thought it would add even more texture to the bird! I have to confess though, as much as I love the fabrics, colors and design of the front of the quilt, I absolutely love the soft minkee back! It makes it all that much more fun to snuggle a baby when their blanket is super soft. You did an amazing job:) I just love your quilt!!! The colors!!everything!!! And the minky love in the back:) I've never tried working with minky, was it difficult to handle? That birdie print fabric is adorable. 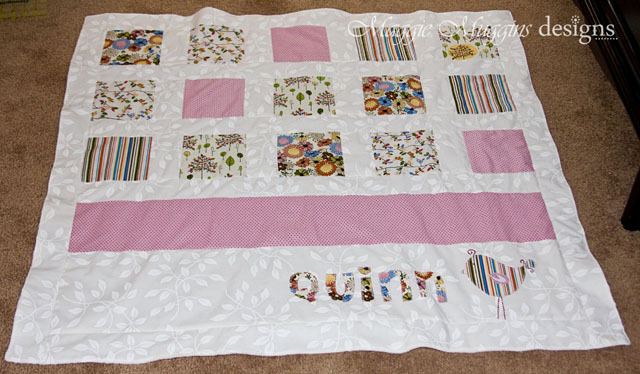 Such a sweet quilt - lucky Quinn (isn't that a sweet name). My daughter was a few years old before I discovered Minkie so she never had any to cuddle - it's dreamy enough to make me want to have another child - just to use that luscious fabric. I especially love the dotty one you chose. Beautiful.